Multi-Effect Distillation (MED) is a thermal desalination technology that produces distilled quality water directly from seawater by using low / medium pressure steam and electricity. With the use of a Thermo Vapour Compressor along with MED, the technology is named MED-TVC. BARC has indigenously developed MED technology and demonstrated production of low conductivity distilled water from seawater on sustainable basis through installation, commissioning and operation of prototype 240 m3/day MED-TVC desalination plant at BARC, Trombay. Plant is in operation and consistently produced distilled water (<10 µS/cm) from seawater, thereby establishing its endurance for long term performance. 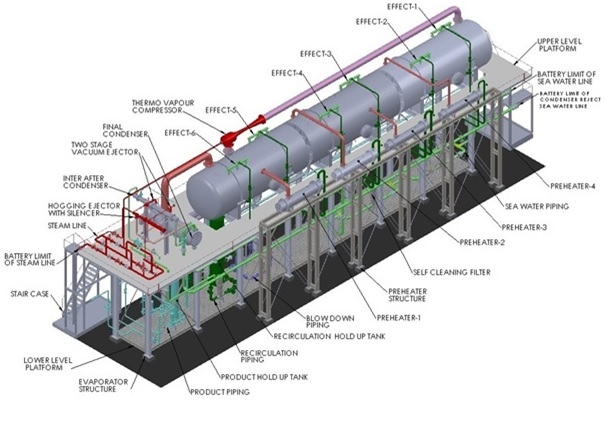 Based on the design and operating experience of prototype MED plant, 1,000 m3/d MED-TVC desalination plants is designed. Know how is available for technology transfer for 1000 m3/day MED-TVC Desalination Plant. Know how includes process flow diagram, P&ID, equipment sizing, tech specs and relevant engineering drawings for manufacturing of the desalination plant and training on prototype for operation of the plant. Parties with sound financial background and relevant engineering experience for manufacturing, assembly and turnkey solution capabilities would be preferred. MED-TVC is a thermal desalination technology having various features and advantages compared to Multi-Stage Flash desalination technology. The plant uses thermo vapour compressor (TVC) for compressing part of vapour generated in last stage, thereby reducing requirement of external motive steam and cooling seawater. TVC has reduced maintenance due to no moving parts. Motive steam at 7-10 bar in TVC is required for compression of vapour. Motive steam requirement is only about 11% of the amount of distillate produced. GOR of around 9.5 can be achieved with only 6 evaporator effects with TVC when compared to around 39 stages of MSF plant. Provision for complete Auto PLC-SCADA based Start-up& Shutdown.. Compact in design due to higher heat transfer coefficients, skid mounted units and modular in construction. Low temperature operation (max 62 °C), low scaling potential, high GOR, low chemical usage, eco-friendly, augmentation of existing water resources etc. MED-TVC Desalination plant of 1000 m3/day capacity to produce Distilled water of conductivity less than 10 μS/cm. Production of Distilled quality water directly from seawater for the use of make-up of process water, cooling towers, boiler feed water, thermal power plants etc. Introduction : Among the thermal desalination technologies, Multi Effect Desalination with Thermo Vapour Compression (MED –TVC), a next generation technology, is modular and compact due to its high heat transfer coefficient achieved through thin film evaporation. In addition, it has low scaling potential and low temperature operation. 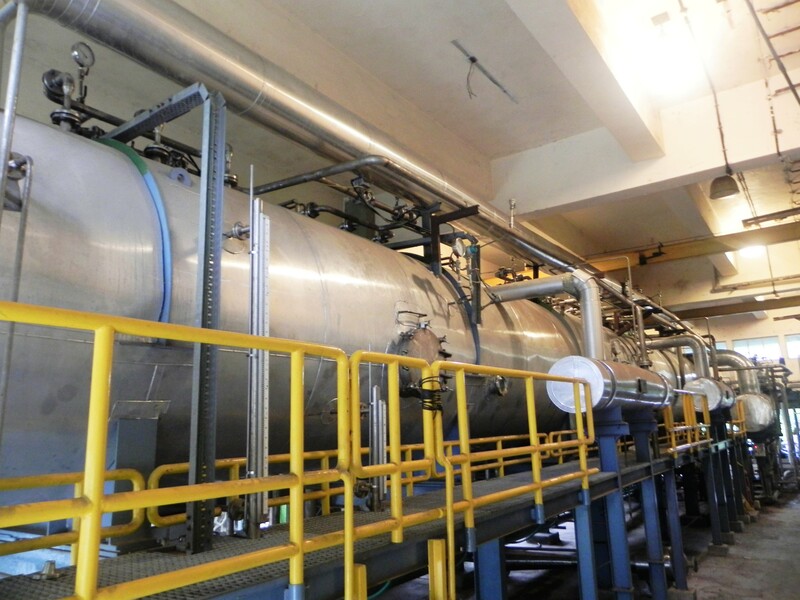 Moreover, TVC is used in MED-plant to compress the vapour from the last effect and recycled as heating media in the first effect, to improve the steam economy and reduces the cooling seawater requirement. BARC has indigenously developed MED technology and demonstrated production of low conductivity distilled water from seawater on sustainable basis through installation, commissioning and operation of prototype 240 m3/day MED-TVC desalination plant at Trombay. Plant is in operation and consistently produced distilled water (<10 µS/cm) from seawater, thereby establishes its endurance for long term performance. Produced high purity water is suitable for high end applications in industries as well as for potable purposes with suitable post treatment of desalted water. Based on the designed and operating experience of prototype MED plant, larger capacity 1,000 m3/d MED-TVC desalination plants are designed. Small and medium sized MED-TVC desalination plants of various capacities find applications in process industries to meet the demand of high quality water. This technology transfer document presents the know-how and technical details of 1,000 m3/d MED-TVC desalination plant as per scale up design based on 240 m3/d MED-TVC desalination plant. MED-TVC seawater desalination plant produces distilled water directly from seawater. This evaporative process has 6 effects which are housed in a horizontal cylindrical vessel. Recirculated seawater is parallelly sprayed in 6 effects over horizontal tubes of the MED evaporators, resulting in evaporation of a fraction of water content of the sprayed seawater. The vapour generated is demisted and used for heating in the next effect. Thin film evaporation of sprayed seawater occurs on the outside of horizontal tubes and condensation of vapour occurs on the inside of the horizontal tubes in the evaporator resulting in high heat transfer coefficient. The concentrated brine and condensed vapour (product distilled water) from each effect is sent to the next effect maintained at a slightly lower pressure. Four Preheaters (shell & tube heat exchangers) are used to preheat the incoming seawater. A thermo vapour compressor uses motive steam to compress part of the vapour generated in the last effect and the remaining vapour from the last effect is sent to the condenser where it is finally condensed using cooling seawater. Necessary vacuum is maintained in the evaporator stages using a 2 stage steam jet ejectors and initial vacuum is achieved by using a hogging ejector. Pumps (1working + 1standby) are used to pump seawater, Blowdown, product and recirculated seawater. Self-cleaning filters are used to remove debris in the incoming seawater. PLC & SCADA System along with necessary electrical and instrumentation systems controls the automatic operation of the entire systems. Distilled water of less than 10 μS/cm conductivity directly from seawater. MED-TVC desalination plant shall have 6 nos. of effectto produce 1,000 m3/day (41.67 m3/hr) desalinated water with conductivity<10 μS/cm from normal seawater with Gain Output Ratio (GOR) of approximately 9.5 based on input steam parameters. * GOR is defined as the ratio of net amount of distillate produced to the net amount of motive steam inlet to TVC for the given MED-TVC desalination unit. Use as boiler or power plant feed make up water, either directly or after minor polishing through mixed bed ion exchange (IX),as perwater quality requirement. This provision either eliminates the need of DM plant, having cation, anion and mixed bed ion exchange resin system, in totality or simplifies it to a MB polishing unit only. Moreover, it reducesthe requirement of chemicals for regeneration of IX beds, hence the chemical burden on the environment is reduced. Distilled water can be used as process water for various systems make ups as well as for circulations in heat exchanger and cooling tower, so that the blow down losses will be minimum. High purity distilled water when purified through Electro de ionization (EDI) produces ultrapure water, which is suitable for various applications and semiconductor and other industries. After suitable post treatment, i.e. addition of relevant minerals, distilled water produces potable or drinking water as per WHO or IS 10500 standards. Augmentation of total water availability by mixing this distilled water with the existing brackish water resources at site. 1. Manufacturing Processes Involved : The shells of evaporators and heat exchangers are made of SS 316L or Duplex. Heat Exchanger tubes are made of Ti. The job is fabrication and assembly intensive. It involves large number of fabrications equipment, bought out items like pumps, instruments, valves, electrical, C&I systems etc. The following are the manufacturing and assembly processes involved in making the desalination plant. Residual engineering from BARC tech specs and drawings based on actual site and bought out items from OEM’s. Structure design and analysis for specific requirements. Plate straightening, rolling, welding etc. In-house Quality Assurance, Testing and Inspections or all parts, sub-assemblies, bought out items, integrated system testing etc. Separate SS fabrication bay without other MS/CS etc. contamination.